Bottle Shoot is all about shooting as many bottles as you can in the fixed amount of time. The game becomes tougher as it keeps progressing. 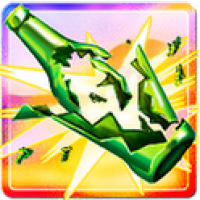 There is also a number of bonus levels in which you can break as many bottles without any obstacle in sight. Bottle Shoot is developed by Droid Hermes, they have had quite a run on Google Play, but seem to have struck the right cord with Bottle Shoot. The graphics of the game are quite crisp, if not great, and the sound effects are close to the shattering effect we would hear in real-life. Levels pass by in a jiffy and keep increasing in pace as the clock ticks. I particulalry loved the scoring system, under which, if the player flings the nunchuck on the same bottle or put it to waste, then the combo ends right there. This little addition makes sure that the player have a better presence of mind in-game the next time. The biggest drawback about the game, even though it is highly addictive, is the fact that you ultimately tend to get bored for there isn�t much to do other than breaking bottles. Nothing that would bring about excitement as the levels progress. There is a bomb and a shield that seldom appears that prevents you from being able to take a proper aim at the bottles but that just is not good enough in the long run. Overall, the game serves its purpose as a casual time-killer. There is nothing great to write about it, but will become a favorite during commutes or a quick 5-min break.